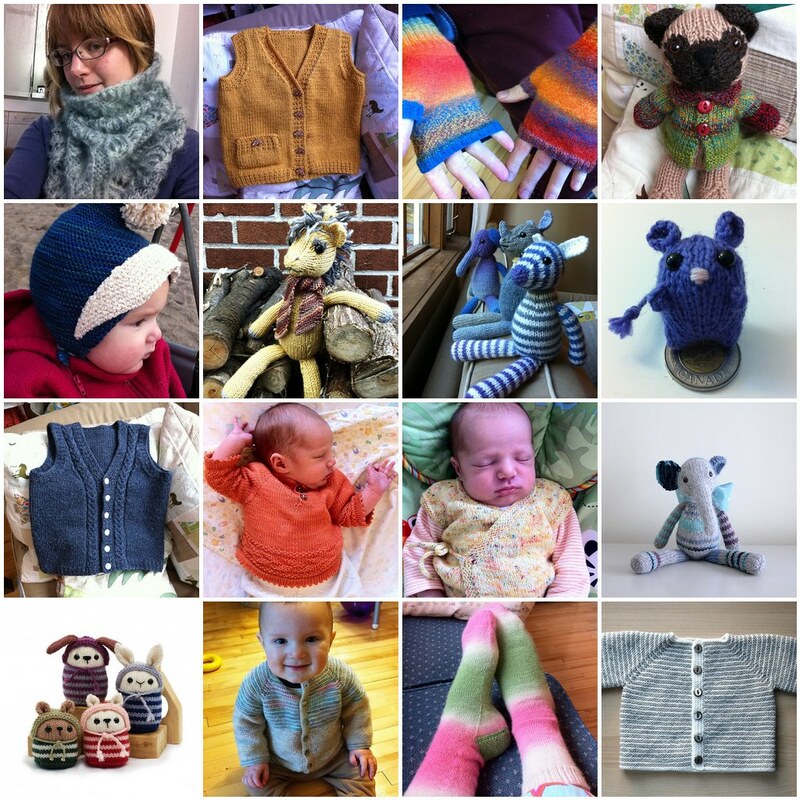 Wow, I have no idea how I found time to knit so much this year. Here are 16 projects I finished, and that's not all of them. I know of several more that I haven't photographed - some toys and toy clothes, socks for the boys, a beret and mittens for myself, a partially finished cardigan for myself, a partially finished pullover for Lev that ended up too small, half-a-dozen hats which didn't fit Kyr, and probably more that I'm forgetting. If you want details of anything, check my Ravelry projects page (I'll try to add anything that's not already there over the next couple days). My goals for next year include a fair-isle cardigan and striped pullover for myself. I also want to finish the cardigan and pullover I had started - the first is lovely and only got abandoned because I messed up the raglan increases, the second will fit Kyr in the Autumn and just needs 1.5 sleeves to be done. I also need a couple more pairs of socks, and I have a few skeins of stashed yarn for which I really want to find projects. I'm sure I will knit toys as well. Maybe I will find time for a few custom toys, or just knit ones for my Etsy shop. At the moment I have no ideas for new patterns. However, this might be a good thing because I have several old patterns that really need my attention. As far as Fuzzy Mitten knitting goes, I'm content to make no plans or deadlines, and just work on each idea as it comes to me. Posted by Barbara Prime at 11:06 a.m.
Barbara! you are so talented! I wish you lived here so you could give me lessons! Lucky children, and hubby and you! To have homeade socks sweaters and toys! All made with love!!! December 31, 2011 at 11:19 a.m.
You have made some lovely things. December 31, 2011 at 11:29 a.m.
December 31, 2011 at 11:36 a.m.
it's wonderful to see a years work in one mosaic like that. quite a feat you've accomplished! January 6, 2012 at 5:09 p.m.
My, you do get a lot of lovely knitting done. I also am planning a fair-isle cardigan for myself this year. January 9, 2012 at 2:21 p.m.
oh my gosh there is Little Squeak again - she is just too cute! would you consider offering a pattern for sale? i think this is a knitted toy i could tackle. thanks for all the joy! January 13, 2012 at 1:45 a.m.